CHOM CHAO INTERCHANGE Project is situated at Songkat Chom Chao, Khan Porsenchey, Phnom Penh, Cambodia. The location of Chom Chao is a central artery where many main roads meet such as National Road No3 (NR3), National Road No4 (NR4), Russian Boulevard (RB) and Veng Sreng Boulevard (VSB) that can creating very serious traffic congestion. 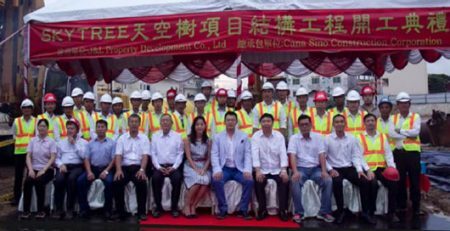 So, on 29 June 2018, CSCC Company (Cana Sino Construction Corporation) celebrated the grand opening ceremony of construction for this Chao Chao Interchange in order to solve this problem and help ease the traffic congestion on the multiple routes leaving and entering in Phnom Penh City. Chom Chao Interchange Project has 3 layers, 5 lines of design solution that need to spend almost 30 months for construction. The service life of bridges last for 100years and the total area is about 61120 square meter. In short, CSCC Company will role as the main constructor for the whole work of this project. Plus, Our CSCC Engineer teams will commit to try our best, pay all efforts and work harder to challenge with this work. We all are ready to start this new mission together. units,700+ car park spaces, located in #KH1+KH2,St….